Nepalese Khukuri House; in collaboration with Joshi Merchants LLC, USA is the finest and genuine Khukuri (gurkha knife) maker as well online kukri seller & exporter of genuine gurkha knife in Nepal. This company was established under the Name of “Nepali Khukuri House Private Limited” and has registered at Government of Nepal, Company Register office (Reg. No 17479/058/59), with the endeavor of wholesaling, supplying as well as retailing only genuine Khukuris (alternative pronounced as kukuri, cookri, Kuk, Khukri, kukri, kukris, kukuri, kookuris, Gurkha-knife, Kukri-knife), National weapon of Nepal. Since its establishment in 1999, it has been manufacturing original Khukuri in Nepal, homeland of Legendary Gurkhas. Our knives(khukuris) are honest, powerful and graceful blades that have the pride of legendary Gorkhas for nearly couple of hundred years and the pride of their owners since times immemorial. Since 1999, the Nepalese khukri/ Kukri House Pvt. Ltd has been striving to offer the best service, value and the largest selection of Kukris/khukuris productions to our customers around the world. Our customers are the most valuable assets of our business. Therefore we are here to help answer your questions about any of your needs and concerns about our kukri/knives. We have been occupying more than 250 Bishwakarma or Kamis (metal-smith, born to Khukuri makera), an ethnic, whose profession is only craft Khukuri in its factory which located in Dharan(Gukhas small home town), a small town, 650 kilometers far from Kathmandu (Eastern Nepal), where the Gurkhas were requited in the past. Four men working a full day to shape each blade that are reinforce carbon steel. Only the selective raw materials such as buffalo horns, leather, rose woods, car or truck spring, brasses, aluminum, white metals etc are utilized to craft each Khukuri. Everything is done by experienced hand and the only machine is used a lathe for shining the Khukuris. The final products is then checked and rechecked many times over and then only packed to be transported to showroom in Kathmandu from its factory. 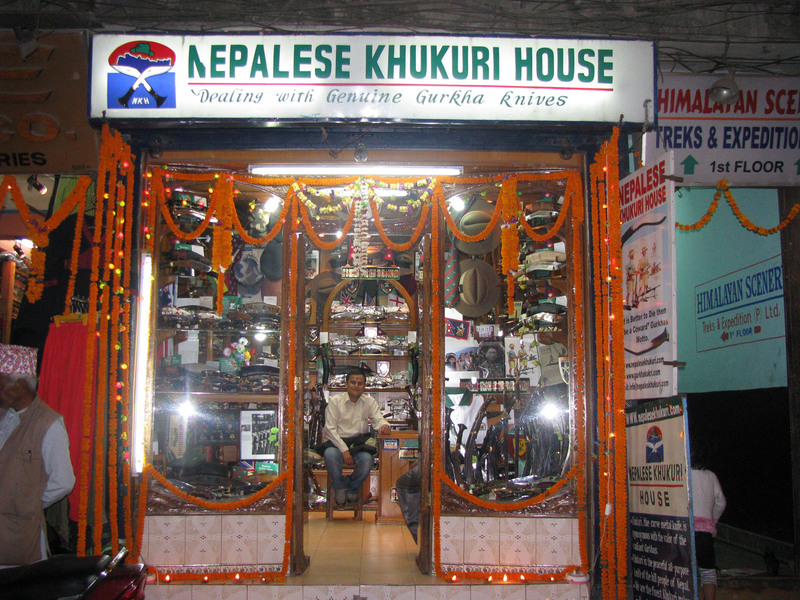 Nepalese Khukuri House is the official Khukuri supplier/dealer to Gurkha unit in Kathmandu, Royal Nepalese Army and Nepal Police. The company supplies its products for resale to major Khukuri/Gurkha knife shops in Thamel, Kathmandu, along with Gurkhas Khukuri House at Thamel J.P. Street, Khukuri House Sataghumti, Thamel, Gorkha Knife Center, Jyatha, Folk Nepal, Mementos at Lazimpat and Khukuri Palace in Thamel. Since its establishment, it has been continuously exporting its high quality Khukuris to Australia, Russia, Czech Republic, Kuwait Canada, USA, UK, Italy, Germany and South Africa etc. The demands of these beautiful Khukuris’ are increasing day by day from globally more than we expected. Nepalese Khukuri House has a wide variety on display more than 200 various items from smallest 4” Latter Opener to 36” long blade Buff Head( Giant kukri), a decorative gift item along with the famous British Army Service No. 1 kukri, which is issued to Gurkha Soldiers. All the handles are crafted from select native water buffalo horns or hardwoods (rosewoodsor Sadan) and fitted individually to each kukri knife. We offer various blades style from the awesome chopper, the Panawal Angkhola, to the slender sword-like Sirupate Models. We offer the finest blades those are made of zone hardened spring steel, (58 to 60 HRC), and are polished to a mirror finish. Each blade is marked \\\"N.K.H.\\\" (Trademark) to let the customer know this is a genuine production of Nepalese Khukuri House. Great attention is given to every detail down to the stitching and hands tooling of the water buffalo hide on the scabbard. The House has big collections of Khukuris most of them represent a particular village or town such as Bhojpure, Angkhola Brass, Dhankute, Chainpure, Cheetlange, Sirupte, Long 18” Dragon, Super, Mini, and Standard Jungle Type, and mementos or souvenir piece, the Kothimora of which the sheath is exclusively, designed using pure silver filigree covering with regiment color in the background. This especial Kukri is presented to a retire Gurkha officer from his regiment as a memento. We can also make tailor-made or custom knives/khukuris and engrave with artistic patterns on special order. Please visit our Online Shop for more details of our products. nepalesekhukuri.com www.nepalesekhukuri.com is the property of Nepalese Khukuri House Pvt. Ltd. As Genuine Khukuris are highly demanded on the worldwide. www.nepalesekhukuri.com has basically developed for supporting to sale its (Nepalese Khukuri House) products through online. Except this prime aim, it has been contained of many related information likewise history of Khukuri and its significances, about Gurkhas, Introduction of Victoria Cross Holders (Winner), general use and utilization of Khukuri etc. Interested Knife business personals (such as knife business men) can establish his/her business community or relationship with Knives/blade/sword forums of world through this site. Actually, we are please to welcome a community (Links) which help to bind all of our sellers & buyers, exporters Khukuri lover and knives collectors. This website is very useful if you searching authentic knife/ Khukuris and if you can not visit to our show room in Nepal then this is a very helpful place to make an order and receive Khukuris at your home or office. We always attempt to make your order precious, effective, valuable and punctual. Once we receive an order from you our Order Management Team (O.M.T.) generally handle your order and inform you about order shipping, payment method and other essential information within 24 hrs. At the nepalesekhukuri.com you will find an enormous web catalog with on-line ordering as well as daily updates to the web site and much more to make your shopping easier as well as secure. Being so far from you (We are in South Asia, Nepal), we generally deliver your items (order) to you within a week through expedited Home Deliver Service provided by FedEx, or UPS or DHL or TNT or ARAMEX Service and are committed to living up to our promise to be the best on-line kukri/Khukuri shopping center in the world.